The Duke of York today visited UK technology company Symetrica, which was spun out of the University of Southampton and is based at the University of Southampton Science Park. Symetrica is a highly innovative company providing next generation radiation detection and identification solutions for the US Homeland Security Market. Symetrica has been a beneficiary of support from the SETsquared Business Acceleration Programme, an enterprise collaboration of the Universities of Bath, Bristol, Exeter, Southampton and Surrey. Symetrica has developed sophisticated techniques which can detect and accurately identify radioactive materials that could pose a threat to security, even when they are hidden in heavily shielded containers. 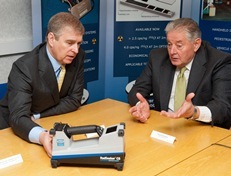 The company’s technology is at the heart of Smiths Detection’s RadSeekerTM, a new radionuclide detector developed by the companies in partnership with the U.S. Domestic Nuclear Detection Office (DNDO) which recently issued a $4.5M order for RadSeeker DL units. The Duke of York’s role in support of The Queen as Head of State, focuses on helping British businesses to create prosperity for the United Kingdom. In particular His Royal Highness provides support to SMEs and entrepreneurs and helps young people gain the skills needed by Industry in areas such as science and engineering. His Royal Highness was able to see some of this technology in action.